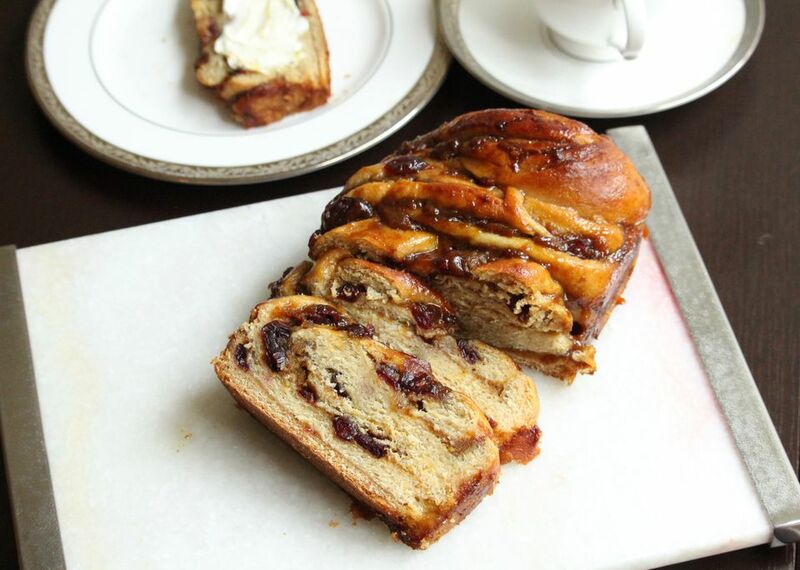 Ribbons of pumpkin spice goodness run through the sweet yeasted dough of this beautiful babka. Studded with dried cranberries, it makes a delicious fall or winter treat with coffee or tea. Toast a slice and slather it with cream cheese for breakfast, or serve it as part of a Thanksgiving dessert spread. On the Holiday Table: This seasonal babka is perfect for Rosh Hashana, when pumpkin holds symbolic meaning for a good new year. And with its fall flavors of pumpkin spice and cranberry, it's also ideal for the harvest holiday of Sukkot. If you have an egg allergy or are vegan, you can make the babka dough without the egg. The dough will be a little trickier to knead, and the crumb will not be as airy, but the babka will still be tasty! Not sure what to do with the leftover canned pumpkin? Besides making a second babka, you can use it to enrich soups or risotto, blend it into a smoothie, or bake it into quick breads or cookies. Need inspiration? Check out these recipe ideas. In a stand mixer fitted with a dough hook or a large bowl, combine the soymilk and yeast. Allow to stand until foamy, about 5 to 10 minutes. In another bowl, whisk together the all purpose flour, white whole wheat flour, sugar, and salt. Add to the yeast mixture, mixing with a wooden spoon or the mixer’s dough hook on medium speed. Add the butter, coconut oil or margarine and mix until incorporated. Add the canola or grapeseed oil and the vanilla, and continue beating until incorporated. Add the egg (if using), and mix until the dough begins to pull into a ball. Knead with the dough hook for 5 minutes, or by hand on a lightly floured surface for 5 to 10 minutes, or until the dough is slightly tacky but smooth. If the dough is very sticky, knead in additional flour, 1 tablespoon at a time, just until the dough is no longer too sticky to handle (Note that if you are not using the egg, the dough may need more kneading, and may not look totally smooth). If you’ve been kneading the dough by hand, return it to the bowl, cover and allow to rise until doubled, about 1 to 1 1/2 hours. While the dough is rising, prepare the filling: In a medium bowl, whisk together the pumpkin puree, brown sugar, cinnamon, ginger, cardamom and nutmeg. Cover and refrigerate until you are ready to assemble the babka. Grease a 9 inch by 5 inch loaf pan. When the dough has risen, punch it down gently. Transfer to a lightly floured surface and pat the dough into a rectangle. Roll the dough out until it is about 11 inches by 15 inches, and about 1/8 inch thick. Spread with the pumpkin filling, leaving a 1-inch border around the sides. Sprinkle evenly with the cranberries. Starting on the long side, roll the dough up jelly roll-style. Pinch the ends together gently to seal. Place the roll seam side down. With a sharp knife, cut lengthwise through the roll–don't worry if some of the filling oozes out–shaping the babka can get a little messy! Lay halves side by side, filling side up. Starting in the middle, and keeping the filling up as much as possible, twist the rolls together by laying one over the other until you get to the ends. Pinch the ends together to seal. After you've twisted one end, do the other side in the same way. Carefully transfer the loaf, filling side up, to the loaf pan. If the twisted loaf is longer than the pan, gently compress the ends between your hands to shorten the loaf. Cover the pan with a clean tea towel or plastic wrap and allow to rise in a warm place until the babka mostly fills the pan, about 1 1/2 to 2 hours. If you’d prefer, you can also cover the pan with plastic and refrigerate overnight. You will need to bring the babka to room temperature before baking. In a small saucepan, combine the sugar, water and cinnamon. Bring to a boil over medium high heat. Reduce the heat and simmer, stirring frequently, just until the sugar is dissolved and the mixture is syrupy. Remove from the heat and set aside. Bake the babka in the preheated oven for 25 minutes. Drizzle evenly with about 2 tablespoons of the cinnamon syrup, then return to the oven and bake for 15 to 20 minutes more, or until the babka is golden and firm to the touch. Remove from the oven and transfer to a wire rack. Brush with a little more of the syrup, and allow to cool completely before cutting.